Say it with love, say it with crystals. 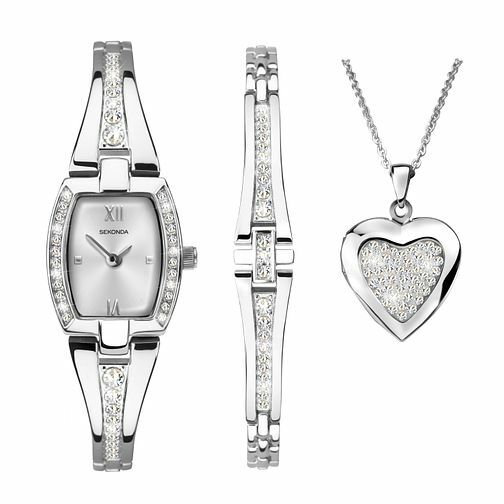 This Sekonda ladies' 3-piece gift set is perfect to show your sentimental side. A silver colour stone-set case presents a stylish silver dial and face, set upon a stone-set bracelet to co-ordinate with the bracelet glistening beside this timepiece. This set is complete with a beautiful heart shaped pendant, stone-set silver tone a sentimental statement piece to sit around a loved one's neck. This 3-piece jewellery and watch set comes presented in a classic gift box, ready for gifting. Sekonda Crystal Bracelet Watch, Heart Pendant & Bracelet Set is rated 4.5 out of 5 by 2. Rated 5 out of 5 by Anonymous from This product is a lovely set We ordered this set for our daughters birthday. It arrived on time as advised and she was very happy with the set. Rated 4 out of 5 by Anonymous from The product looks and feels of very good quality and was packaged well. Good easy to follow instructions to purchase.excellent quality for price,did have a fault on the watch but resolved very professionally by your customer service and very good service at your wrexham store.thank you.